The most successful professionals are more than experts - they are known as authorities. In today's digitally driven world, one of the best things you can do for your career is to work on your authority status. 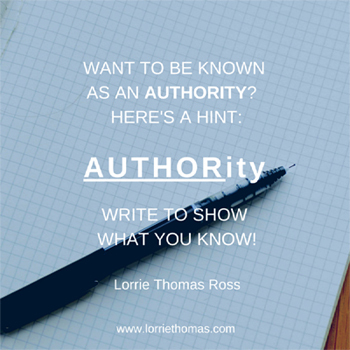 The first step to go from being an expert to becoming an authority is simple: Write to show what you know! In the word authority is the word author. Share relevant information on a blog and/or social media outlets. When you share information that is helpful to your target audience, you boost your online visibility and demonstrate your credibility as an authority in your field. Updating and optimizing your web and social media presence is the next step. Make sure your profiles on social media clearly state what know. When you are writing your profile descriptions on your site, blog, Twitter, Facebook and LinkedIn, be sure to use descriptive phrases. My last tip as you begin to work on your personal brand is to have a clear and consistent tone across all channels. I will be hosting a webinar called The Power of Personal Branding for Professional Success on Tuesday, February 24th, 2015, 3:00pm to 4:00pm ET where I will be covering in depth ways to improve your authority status and position yourself to attract more of the work you want!